In fact, she has a lot of ideas, and perhaps one day she might have her own blog, likely it’ll be very differernt to mine, as it’ll be a hell of a lot more creative and crafty than I could ever have managed….you see my daughter is awesome. This weekend, we made our own monopoly board, based on our local Saffron Walden town. 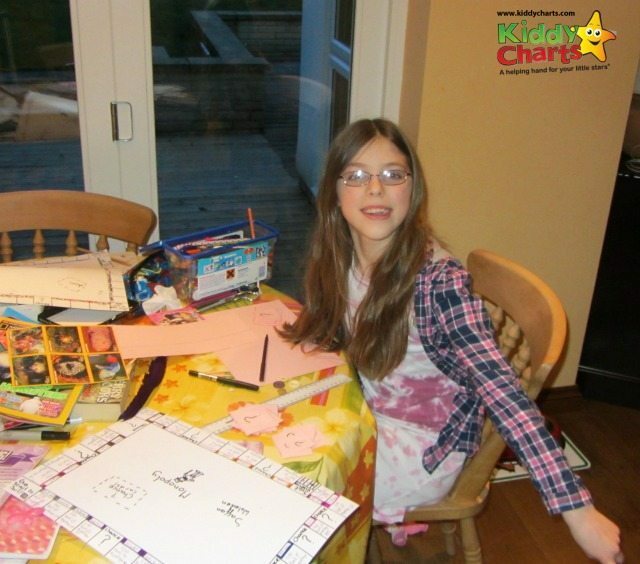 We then created some money, Chance cards, grabbed some dice and had a game together! 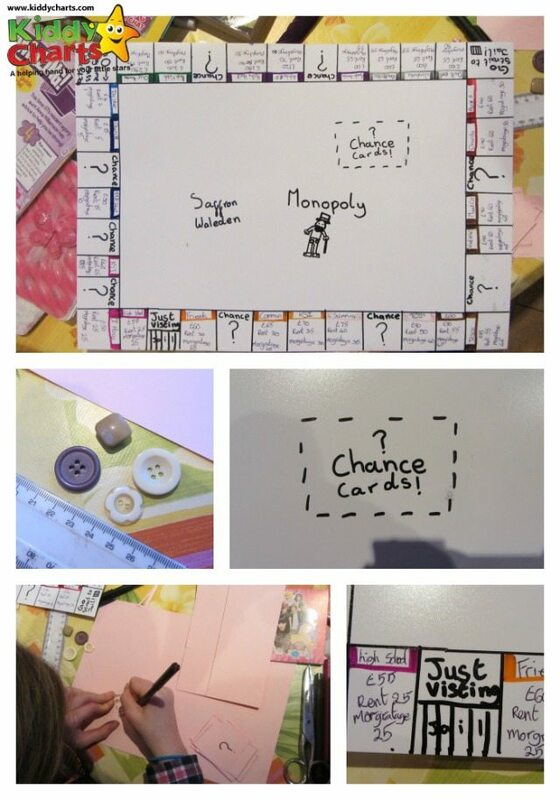 It was a simple craft activity that kept her occupied all day, and the litte grey cells worked overtime thinking up thirty different ideas for the chance cards, the spaces and colours for the sets on the board, and the way that she would play the game without having to make single cards for all the property she decided on. I thought it was so wonderful that I would share it with you…. Once you have gathered all these materials, all you really need to do then is to let your kids’ ideas carry you wheverer they want you to go! Create a prototype for your board on a rough piece of A3 photo paper; this way you can plan out which locations you are going to have on the board, where your chance spaces will go, and how many sets you are going to create. Once you are happy, create the real thing! You win a football match, roll again, and so on. Grab your dice, and you are ready to go! This is a little less sophisticated than the proper game of Monopoly which we have in our lounge , as we didn’t make any houses and hotels. The aim of the game is to continue until all the properties have been bought, and then you can see who has the most money. Alternatively, you could put a time limit on play. However, a lot of the fun is in the making, so I wouldn’t get too hung up on the rules! 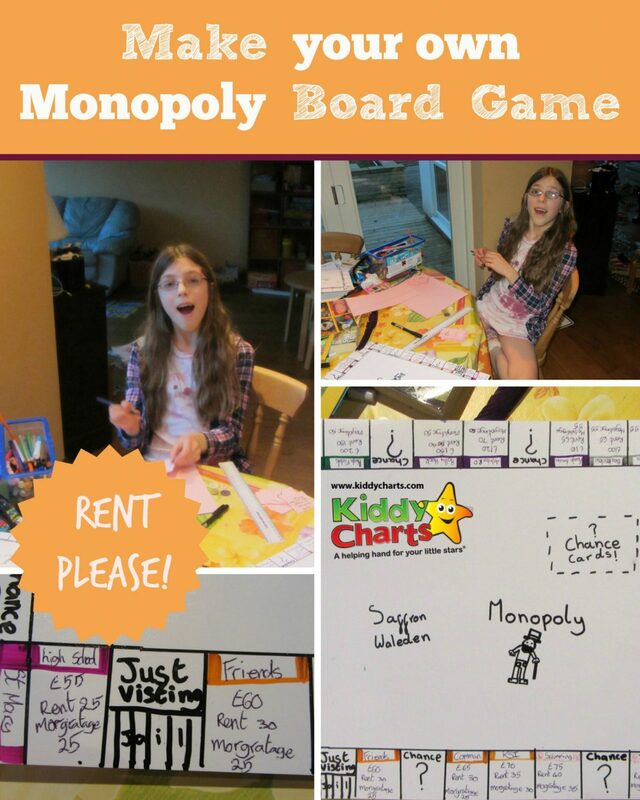 We hope you like our homemade Monopoly; if this has given you a hankering for the real monopoly , there are some great new versions of the game out there at the moment, from the Monopoly Despicable Me 2 Board Game , to a Liverpool Monopoly set…think I might add that one to the Daughter’s list for next Christmas! If you really did want to build some hotels and houses, I am sure you could do so, or perhaps just find some small stones to use instead. Perhaps you could use bigger ones for the hotels, and much smaller ones for houses….